The tomato is for me the undisputed star of summer. 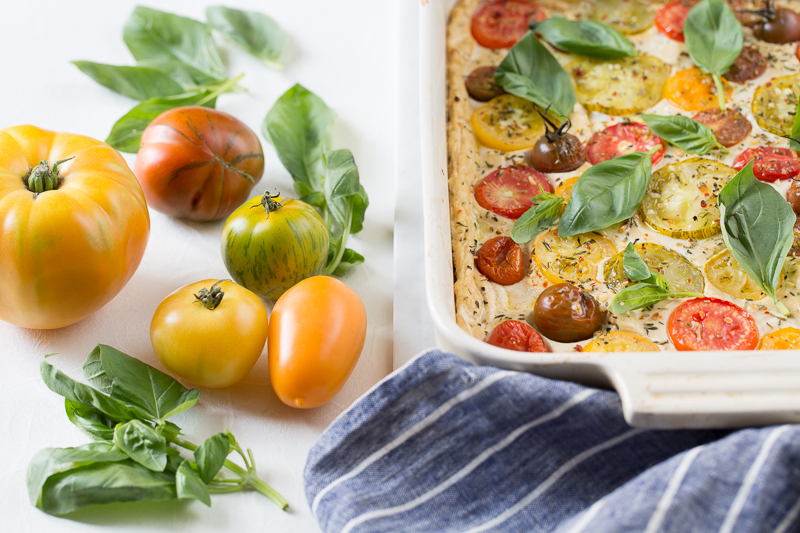 I know I have sung my praises of summer berries and many other ingredients and indeed, there are so many stars to choose from but when it comes down to it, tomatoes are my all-time favourite summer treat. When the first local tomatoes appear at the farmers market I cherish them using them ever so frugally and scatter them in pretty much every dish I make. My favourite way of eating them is on slice of good toasted sourdough bread with a pinch of flaky salt, a grinding of black pepper and a drizzle of good quality olive oil. Any additions would dillute the gentle and fragrant taste of tomatoes. The more they ripen the better they are and of course the possibilities are endless but when I want to make them really shine then I stick to good old Italian style dishes like a good simple Marinara or a Pappa al Pomodoro. One day after making a lot of tofu, I thought why not combine the two and create a kind of baked dish. I didn’t know before that the texture would be like a soufflé but when I pulled it out of the oven the first time I was astonished at how much it resembled a soufflé. After a few minutes out of the oven it deflates a looks more like an omelette but who cares, its the flavour that counts and I’m pleased to report that it is not only texturally wonderful but also delicious. 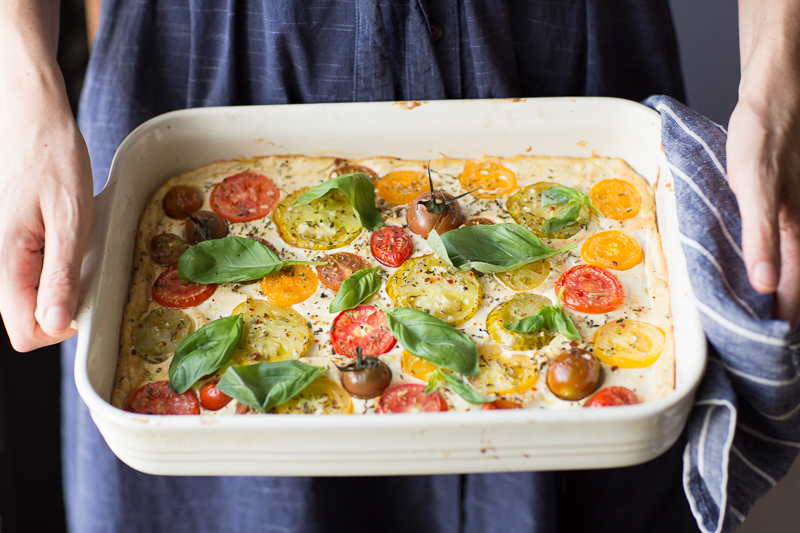 The tofu provides the perfect blanket or background for the tomatoes to really shine. 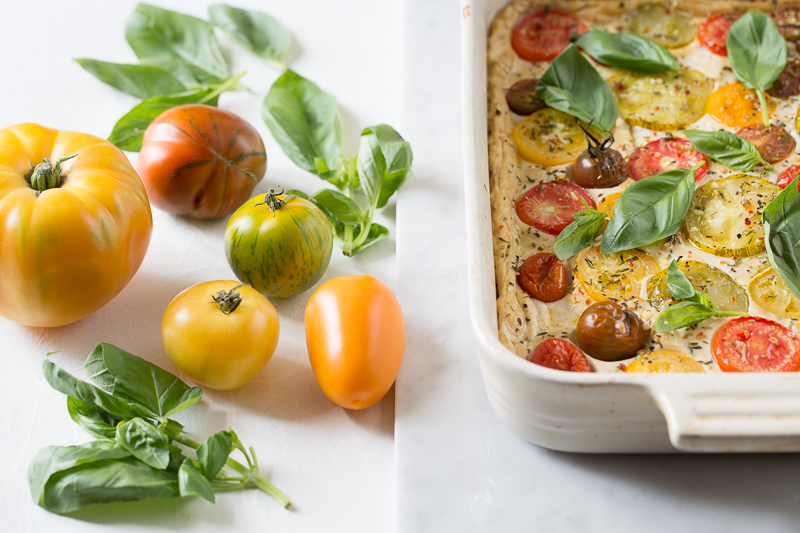 Basil was the icing on the cake or icing on the soufflé in this case and because tomato and basil are a marriage made in heaven. I made tofu for the first time about a month ago after my dear neighbours brought me a tofu press from Japan. It is time consuming and a little bit finicky but the end result is divine and bears no resemblance with the store bought tofu. The texture is ultra creamy and the taste is delicate and not penetrating at all. I used locally grown soya beans and I suppose that that makes a difference and also the fact that most things that are homemade are better. There are a few things that I confess I can’t get quite right and those are very authentic Indian or Asian dishes and a really good sourdough pizza. Since most of you probably won’t be making their own tofu to make this dish, I highly recommend the Taifun brand of silken tofu. It is a highly reputable company from Germany and they have really high standards and use only soya beans grown in the heart of Europe. 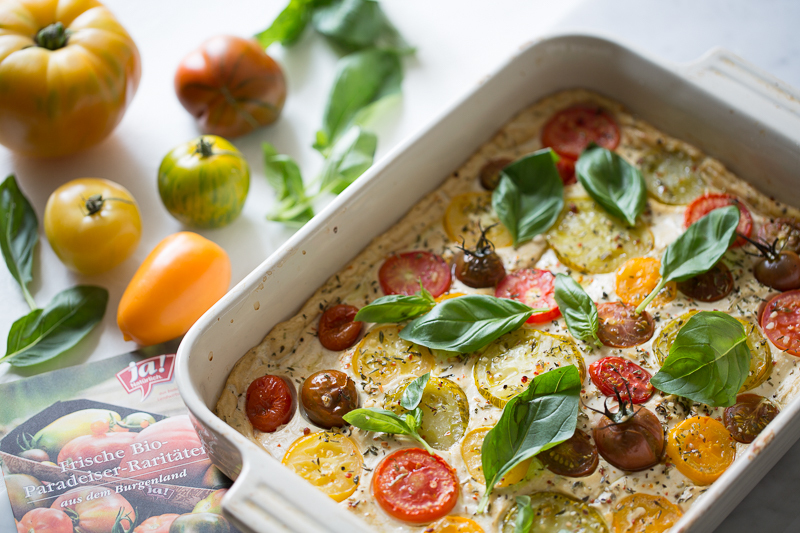 I also recommend using different kinds of heirloom tomatoes to get a beautiful spectrum of different tomato flavours. From start to finish this dish takes a little over half an hour which makes it an ideal weeknight meal. I suggest eating it with some crusty bread and a light green salad. Like all really good summer dishes, it doesn’t require much effort and the focus here is on really high quality ingredients coming together to make something greater than all its parts. I hope you give it a go and as always, I would be delighted to hear feedback in the form of constructive criticism or simply how you enjoyed it. If you share it on Instagram don’t forget to tag me #vegan__art. Preheat the oven to 190 °C.Grease a casserole dish lightly with olive oil. Place the tofu with the lemon zest and juice, garlic clove, salt and pepper into a food processor and blend until smooth. Transfer the tofu mixture into the dish and smooth out the surface arranges the slices of tomato on top keeping the cherry tomatoes if using any. Drizzle additional olive oil on top and sprinkle with salt, pepper and the herbes de provence. Bake for 25 to 30 minutes until the edges have browned and the soufflé puff up a bit. 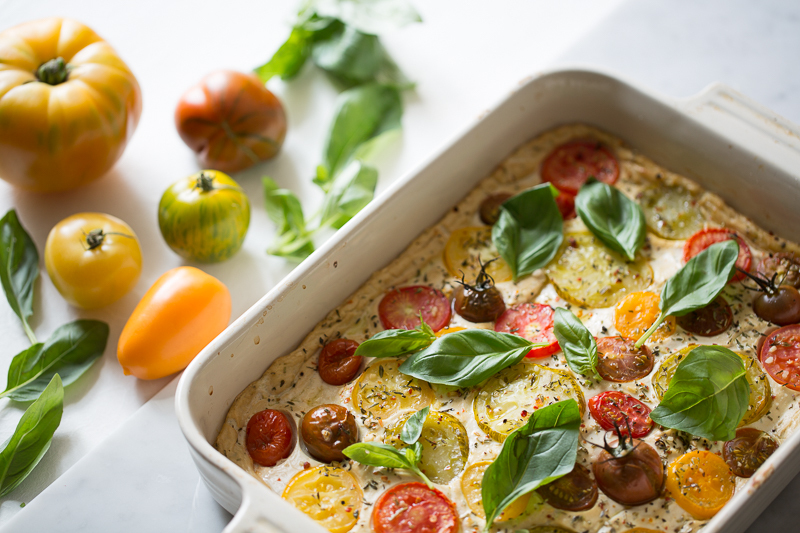 Remove from the oven and garnish with fresh basil leaves and let cool a bit before serving. I made this dish with a bottom layer of 250 g polenta to which I added 1 tsp oregano. I let the polenta get crispy during the preheating pediod in the oven.. I put a layer of tomatoes on the polenta, covered it with the tofu mix (400 g was enough) and then I put another layer of tomatoes on that. Delicious! A full meal and no need for bread. Thank you for your feedback. 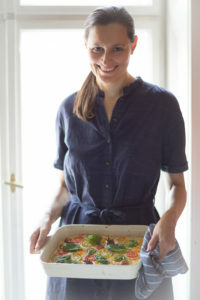 I love it especially when recipes are personalized.